The Jobs Machine of Campbell County is the second of a three-part WyoFile series, Hispanic Wyoming, looking at changing immigration trends in the Cowboy State, and how Wyoming’s Hispanic population has become more diversified. A Shift From Agriculture ran on April 26 and ‘A Good Place to Live‘ appeared on May 10. GILLETTE — In Campbell County, Hispanic migrants originally come from all over Mexico, plus Honduras, Guatemala, El Salvador and even Puerto Rico and Argentina. They come to Gillette for the money, but stay for sense of security and the schools. Energy-based jobs provide the primary draw. A booming economy based on the troika of coal, oil and gas development, and major industrial construction (most related to energy) has turned Campbell County into an employment machine. Between 2000-08, Campbell County’s unemployment hovered between 3.1 percent and 2.0 percent. In Wyoming only Sublette County had a lower rate, 1.7 percent in 2008, according to Wenlin Liu, senior economist with the Wyoming Economic Analysis Division. The Powder River Basin produces roughly 40 percent of the coal mined in America. The number of miners needed to produce that coal has doubled in the past decade to nearly 6,000, according to information provided by the U.S. Mine Safety and Health Administration. In addition, since 2005, Campbell County has seen the construction of two major power plants: the $1.3 billion, 385-megawatt Dry Fork Station coal-fired power plant (which required 1,300 workers) and the $224 million, 110-megawatt WyGen III power plant. In fact, a February 2010 report issued by the City of Gillette estimates that from 2000-09, companies and municipalities invested $3.2 billion in Powder River Basin infrastructure, including commercial development, power generating stations, coal mine improvements, upgraded or new public facilities, roads and upgrades to the railroad network. In 2005 and 2008, natural gas prices spiked to over $13 per thousand cubic feet, driving up Power River Basin coal-bed methane gas production. In 2000, Campbell County produced 10.5 billion cubic feet of gas per month from coal-bed methane wells. By 2005, the industry was producing 25 billion cubic feet per month. All this growth provided opportunity not only for transient, poorly educated laborers, but for people with different skill sets: equipment operators, educators, managers, retailers and merchants. Hispanics with those skills were among those who have come to Campbell County to work and make a home. 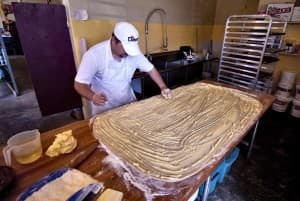 “I am here for the work,” said Carlos Ortiz, a professional baker who recently moved from Colorado with his wife and two children, age five and two. “Too much competition in Denver,” he said. 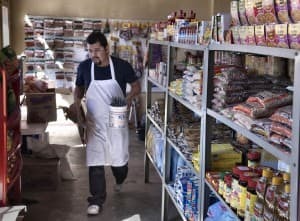 Ortiz operates a bakery for the Rosiles family, who own a grocery store/bakery in downtown Gillette called El Ranchito. The store caters to Hispanics seeking what they can’t find in Smiths or Albertsons: menudo, brown sugar cones, coconut juice, Mexican baked good, spices, corn meal, cookware, piñatas and the big seller, telephone cards to various Central American countries. Co-owner Marco Rosiles said he moved to Gillette from Yakima, Wash., in 2010. For Hispanics, most work in Campbell County is found boca a boca, word of mouth. Labor officials agree. “They (Hispanics) have a network already established,” said Vermona Petersen of the Gillette branch of the Wyoming Department of Workforce Services. “It was easy to find work. I had friends,” said Jose Miranda-Ramirez, a builder for Pro-Built Homes of Gillette. Miranda-Ramirez and his wife, Judith, their children Noel, Cristobal and Brianna moved to Gillette three years ago from a town in the eastern-central Mexican state of Hildalgo. This urgency might also apply to Hispanics working in Wyoming. “We have to work,” said Berta Nava. “You know those men dressed in Carhartts and coveralls out there working at 20 below zero? 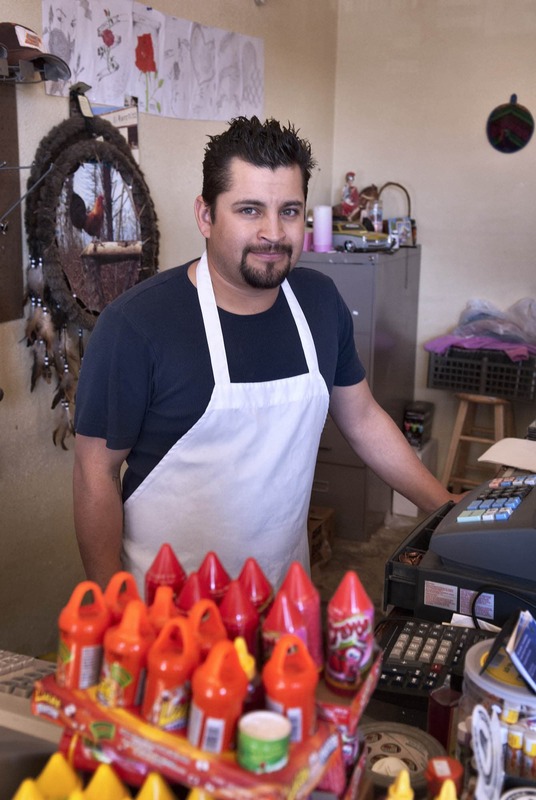 Many times their skin is brown,” said Nava, who owns a grocery, La Casita, which operates just around the corner from El Ranchito. Filing for unemployment is out of the question for most Hispanics, said Nava, unless they are citizens. The majority, who have work permits – the “green cards” officially known as a U.S. Permanent Resident Card — can’t file for unemployment. U.S. Citizenship and Immigration Services issues green cards on the basis that a company can employ an immigrant on a permanent basis. A claim of unemployment proves otherwise. Furthermore, most Hispanics have financial obligations in their home country. No figures are available for Wyoming’s Hispanic out-of-country remittances. 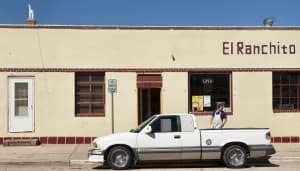 But in 2009, Mexicans alone working in the U.S. sent remittances worth $21.2 billion, according to the Bank of Mexico. Georgianna Lopez Hernandez, a Spanish-English translator, is married to Juan Lopez, a migrant from Jalisco, Mexico. He and other Hispanics work for United NRG, one of the dozens of companies that builds, or helps build, pipelines around the Powder River Basin. The crew of United NRG is biding time, working inside as they wait for better weather and the lifting of seasonal regulations concerning the sage grouse. In order to protect the diminishing sage grouse population, state and federal regulations prohibit oil and gas development activity in certain areas during certain times of the year. The pre-fab building where Lopez and others are working resonates with the din of off-season repairs: hammers bang out dents, compressors roar and paint guns hiss. Even though it’s bitter cold outside, the men keep an overhead door open to provide adequate ventilation. In a relatively quiet cubbyhole of an office, safety manager JD Eickbush, tries to settle his 6-foot, 5-inch frame into a chair. About 70 percent of the applicants for labor jobs at United NRG are Hispanic, said Eickbush. Pipeline companies like United NRG will hire migrant labor, employ them for as long as it takes to get the job done, usually four to six months, then let them go. But usually a worker can get another job. “They rotate from one place to another,” said Eickbush. Still, there are slow periods. United NRG is down to a skeleton crew of 11 men. At peak time, they have about 40 employees. Lopez says he’s grateful for his job at United NRG. He’s climbed his way up to pipeline work from tending sheep and cattle (mostly around Douglas), irrigating, landscaping, tree trimming and landscaping. He cannot read or write, either in Spanish or in English. Although he works fairly steadily, he still worries about finances. Two years ago, he went seven months without a job. “I showed up every day (at various pipeline companies) looking for work. Eventually I got re-hired,” he said. United NRG equipment operator Victor Quiñones first came to Wyoming from Chihuahua in 1993 and worked sugar beets and beans in Torrington. Then, following energy development, he moved to Douglas and, in 1999, to Gillette. Throughout the years, he acquired skills as a trackhoe and excavator operator and rarely has trouble finding work. “I came here legally and never came here to take someone’s job,” he said. Quiñones is not sympathetic to illegal immigrants, especially those who run afoul of the law. “Give them the boot,” he said. Quiñones’ intolerance of immigrants who don’t play by the rules creates a curious dynamic. “Most of the reporting to the authorities of illegal immigrants are called in by other immigrants, some of whom are illegal themselves,” Hernandez said. Mexicans have some camaraderie with fellow expatriates from various states such as Jalisco, Nayarit, Durango, San Luis Potosí, and Chihuahua, but there’s not necessarily friendship among between all Spanish speakers, she said. Mexicans accuse Hondurans of acquiring fake Mexican papers so, if they are apprehended and deported, they end up just on the other side of the U.S. border, not 1,000 miles south in Tegucigalpa. Both Quiñones and his wife have green cards. They have four children, ages 18, 15, 12 and 10, in the Gillette schools, which he says, “are the best.” His daughter won an essay on “why we celebrate Martin Luther King day” and, as a reward, got to spend the day tagging along with then-Governor Dave Freudenthal. While rarely overtly hostile, some in Gillette did not put out the welcome mat. When Nava and her husband moved up from El Paso in 2001, they were not warmly received by all quarters. “The second day we were here, we were moving into a house trailer when the police showed up. They said someone in the trailer court had reported a stolen TV and had seen Mexicans driving in a truck with Texas license plates and assumed we had committed the crime,” she said. “But Gillette is getting used to us,” said Nava. After her visit, she and her truck-driver husband decided to move to Gillette permanently. Nava said it wasn’t easy at first. She got a job at Walmart. People stared at her and made rude comments when she spoke in Spanish on her cell phone. 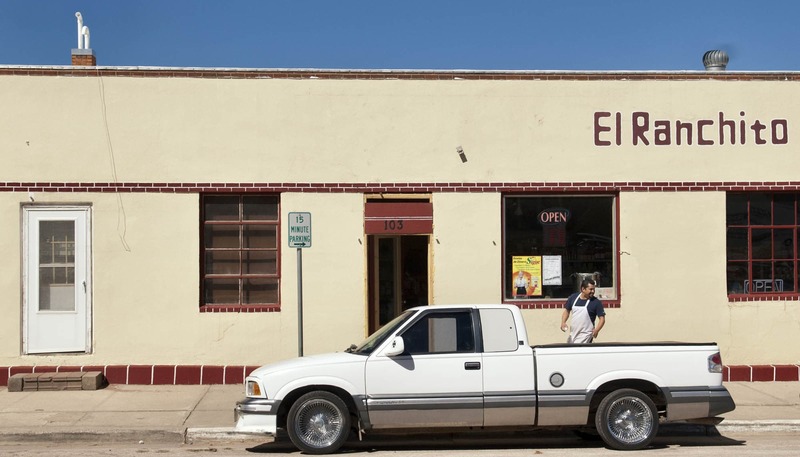 In 2007, she started a bodega-style Mexican grocery, La Casita, in downtown Gillette, and has had to move once because demand for her products required expansion. She sells mostly groceries, but also clothing that Hispanics can’t find elsewhere in Gillette, such as men’s white jeans, and children’s outfits for first communion or quinceañera, the celebration of a girl’s 15th birthday. Nava says she appreciates the schools in Gillette. Her son goes to Meadowlark Elementary, a school that, until last year, had 131 Hispanic children out of a total student body of 301. “My son loves that school,” said Nava. In contrast to previous generations of migrant Hispanics who saw education as a luxury, this generation sees schooling as critical. Meadowlark became so heavily weighted toward Hispanics that in 2010 Jankord asked for a de facto integration, sending some Hispanic students to Hillcrest and Rawhide Elementary schools. “They were overwhelming our ESL (English as a second language) teachers. Plus, they were not getting the opportunity they deserved to mix with the other kids,” he said. The Hispanic concentration tends to be in the elementary grades, said Jankord. Hillcrest Elementary now has 96 Hispanics out of 705 students; Rawhide Elementary has 61 out of 291. The entire Campbell County school district has 705 Hispanics out of 8,499 total students. The writing is on the wall, said Jankord, citing a January 2009 Education Week article titled Immigration Transforms Communities. The article detailed the community of Springdale, Ark., which, like Campbell County, once had few English-language learners, but then the good economy began drawing new immigrants. By fall 2008, Springdale’s “English-learner population alone stood at 7,000 children — roughly 40 percent of the total enrollment of 17,400 students,” wrote author Lesli A. Maxwell. Some Hispanics have taken education as a career. Adriana Gutierrez moved to Gillette in 1997, barely able to speak English. Now she is a teacher’s assistant for English as a second language at Twin Spruce Junior High. Educated (she was an accountant for a construction company in Mexico), motivated and endowed with surplus energy and enthusiasm, she has taken a liking to Gillette. “It’s a little town with people who really care,” she said. Gutierrez is not afraid to tackle political issues, making her a very visible Hispanic immigrant in Wyoming. In a space of less than 10 years, she moved from someone functionally illiterate in English to an advocate for Even Start, a state- and federally-funded program aimed at academic achievement for young children and their parents who are learning English as a second language. When the 2010 state Legislature wavered over funding all five Wyoming Even Start centers, Gutierrez began writing letters and successfully campaigned to prevent any center from closing. The temperature outside shrivels the mercury in the glass to minus 21. Yet, step in the door of the La Frutería De La Cruz, and the smells and colors of Mexico greet visitors. The tang of oranges and tomatoes mixes with the earthy odors of yucca. Pale green chayote, a squash, lie beside a shade of aqua belonging to the prickly leaves of aloe vera. 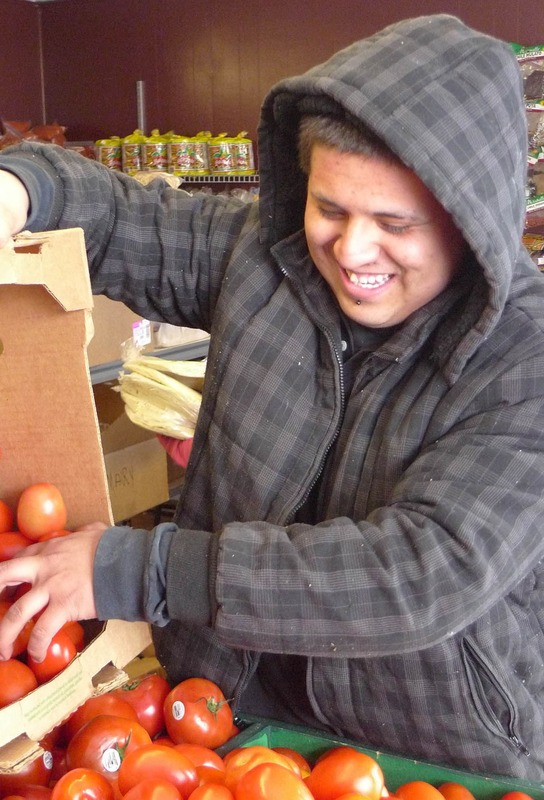 La Frutería De La Cruz specializes in fresh produce. The store has no refrigeration system, not that they need to worry keeping vegetables cooled on a day like this. The problem is too much chill. Worried about possible damage, Francisco Delacruz and his father, Francisco Sr., hurry to unload a truck they drove up from Denver the previous night. Each Wednesday, father and son drive to Denver and visit various fruit and vegetable wholesalers, and fill up their truck with specialty items like fresh tortillas. They return by Thursday afternoon to get ready for Friday sales, their busiest day. Francisco Sr. sold fruit in Mexico, moved to California and, eventually, ended up working in the oilfields of Wyoming. Injured while on the job (he declined to talk about the incident), he had time on his hands during recovery. Two summers ago, he began roasting chilies in downtown Gillette. This led to selling produce, two or three boxes at a time. He consistently sold out and began prowling the produce sections of the chain grocery stores in Gillette, including Smiths and Walmart, and thought he could sell produce “a little lower” than anyone else and make money. Yet with typical ambition, Delacruz aspires to not only sell produce. He wants to grow it. Samuel Western is a freelance writer living in Sheridan. Samuel Western of Sheridan is a university lecturer, poet and U.S. regional correspondent for The Economist. He is the author of Pushed Off the Mountain Sold Down the River: Wyoming’s Search for Its Soul (2003), and A Random Census of Souls (2009). Thank you for telling this story. You did a great job showing that the statistics we hear about are real and inspiring people.